A toxic mix of nepotism and abuses has defined several sons of the Arab world's most infamous tyrants. They rose to power because of their bloodline, and those who fell, sometimes in a grisly manner, did so because of what they had done in the family name. Saudi writer Jamal Khashoggi was killed in Istanbul by men with reported links to the kingdom's Crown Prince Mohammed bin Salman, raising questions about his involvement. Before global outrage arose over Khashoggi's death, the brash Prince Mohammed was already the focus of criticism for the catastrophic war he has prosecuted in Yemen, his imprisonment and shakedown of other Saudi princes at home, and his interference in Lebanese politics by way of effectively abducting that country's prime minister. Prince Mohammed seems unlikely to fall, at least for now, as long as his father remains on the throne and the Al Saud succession is not derailed. The dynamic of brutal and avaricious offspring is not unique to the Middle East: the world's best-known autocratic family is the Kim dynasty in North Korea — one that does not look like collapsing any time soon after 70 years. In Africa, Congo still reels from power being passed from Laurent Kabila to his son, Joseph, after he was assassinated in 2001. But it is the lives and brutal actions of the sons of several Middle East dictators over the decades — whether they came to power or not — that have made their own violent and corrupt marks on their nations. They have been seared into the collective memory in the first two decades of the 21st century. Jeremi Suri, a professor of history and public affairs at the University of Texas at Austin, said hereditary succession is not unique to authoritarian states, but they are more likely to be flagrantly violent in the Middle East. That's because intense regional competition and declining prospects at home have driven leaders to paranoia and the international community has shown a propensity to look the other way. "They are hyper-violent ..., using extreme force to prop up their power for fear of a coming deluge," he said. Here's a look at the heirs in Iraq, Syria, Libya and Egypt. On the eve of the US-led invasion of Iraq in 2003, then-US president George W. Bush gave Saddam Hussein and his sons 48 hours to leave the country. They didn't. 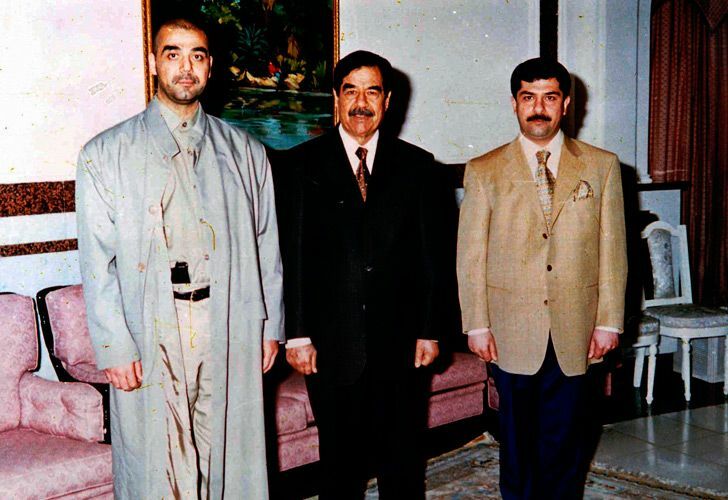 Uday and Qusay Hussein were killed four months later while on the run in a fierce firefight in Mosul. Images of their bloated and bloodied corpses were broadcast around the world to confirm their demise. Their father was captured alive, then hanged three years later. Before the fall, Uday was feared and reviled for his violent, maniacal and unbalanced tendencies. Tales of his cruelty were legend in a nation where the family ruled by cult of personality, repression, torture and execution. Uday beat a favoured Saddam bodyguard to death, was accused of multiple rapes, and barely survived an assassination attempt that left him with a limp. The quieter Qusay was thought to be Saddam's preference to succeed him. Bashar al-Assad, a Western-educated eye doctor, was never the choice of his father, Hafez, to take over from him as leader in Syria. The eldest son, Bassel, had been groomed for the role but was killed in a car crash in 1994. When Hafez Assad died in 2000 after ruling for 29 years, it was Bashar who took over. Some in the West thought he could be a useful ally in the region. That all changed after the brutal crackdown on Arab Spring protests accelerated into a civil war that claimed the lives of hundreds of thousands of Syrians, displaced millions internally, with millions more fleeing overseas, and destroyed the country's infrastructure. Assad was on the cusp of defeat and a probable demise not dissimilar to Saddam. But Russian military support turned the tide in his favour. Now, with the civil war in its final phases, his rule seems set to continue. Muammar Gaddafi's rule spanned more than three decades. The Libyan chapter of the Arab uprisings in 2011 spiralled into civil war with atrocities committed both by Gaddafi's forces and the popular opposition. His son and one-time heir apparent, Seif al-Islam, had faced charges of crimes against humanity for his role in trying to put down the uprising. Western forces intervened on the rebels' side, with punishing airstrikes that proved a major catalyst to Gaddafi's fall. In gruesome images seen around the globe, Gaddafi was captured by rebels who humiliated him in his death throes. When his son was captured, he was shown with fingers missing, purportedly from an airstrike. Seif al-Islam was pardoned by parliament and released in June. He has not been seen in public since then. With Hosni Mubarak's blessing, his sons Gamal and Alaa plundered Egypt's coffers during their father's decades-long rule. Gamal was once next in line but wasn't thought of as a serious individual outside his father's inner circle. The brothers were detained with their father two months after a popular uprising in 2011 forced the senior Mubarak to step down after 29 years in power. They were later sentenced to three years each for embezzling funds meant for maintenance of presidential palaces. The sons were released in 2015 for time served, while their father was freed last year. The sons have frequently appeared in public, receiving a relatively warm welcome, but drew the displeasure of powerful backers of President Abdel-Fattah el-Sissi.